2017 marks the 100th Anniversary of our Moosehead Lake Maine bed and breakfast. The main building at the Lodge was built in 1917 as a private residence owned by the Sloper family of Connecticut. The Sloper brothers, both bankers, built summer homes overlooking Moosehead Lake. This home was referred to as Greenslope. In the 60’s and 70’s the Lodge became a restaurant called Lakeview Manor serving to the public. Guests dined in, what are now, the great room and library and the owners lived on the second floor. Over 25 years ago, the property actually became The Lodge at Moosehead Lake. It was owned by Jennifer and Roger Cauchi and it was Jennifer’s eye for design that added the birch twigs, mixing wing back chairs, oriental rugs and one-of-a-kind hand-carved beds with twig furniture. They were the first in the area to offer luxury accommodations. They started the first Moose Safari’s after recognizing travelers’ interest to explore the Maine woods and of course see moose. They married the décor of the North woods with luxury accommodations. Despite much skepticism, Roger and Jennifer made it a huge success, opening a new traveler demographic and making it possible for other luxury lodging to enter the market. The Cauchi’s also built the Carriage House to the north of the Lodge. Originally a garage but eventually, they turned it into a retail shop with unique gifts and accessories for all occasions, called Miss Elaine E. Moose serving their guests and the Moosehead Lake area. They later transformed the Carriage House into luxury suites and added a second story. After more than ten years of hospitality business, the Cauchi’s sold the Lodge. The new owners had a different sense of style and gave the lodge more of a country feel. In 2007, the lodge was purchased by Dennis and Linda Bortis who brought back the original luxury North woods character. Unique and authentic outdoor adventures were added as well as Up North Cuisine in the remodeled dining room and the trademarked Mooseopolitan™ Martini, enjoyed by many. 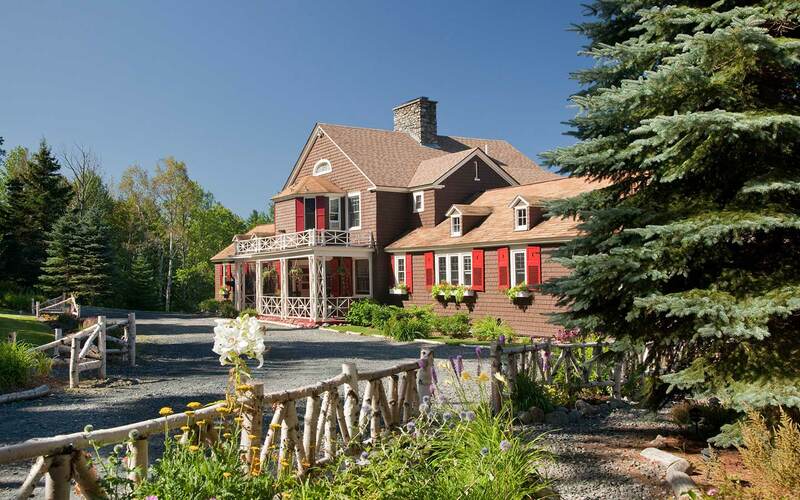 The Lodge was the first 4-diamond AAA property in inland Maine and has remained so for the last 23 years. The Lodge continues to serve guests from near and far. Travelers come to the Lodge seeking the combination of breathtaking views, North woods adventure, great food and authentic rustic luxury that no other Maine property can provide. Dennis and Linda are proud to have made extensive upgrades to the Lodge accommodations during the last ten years while maintaining the Lodge’s reputation for attention to detail and unsurpassed guest services.